Those cute puppies have got my attention again with a fantastic new competition! Andrex, the nation’s favourite toilet tissue, this week launches a fantastic new Puppy promotion exclusively on Facebook. Each of the 6,500 fans of the Andrex Puppy’s Facebook fanpage will have the chance to win one of thirty top prizes every day with a total value of over £20,000, simply by entering a fun competition. Top prizes include Nintendo Wii Consoles, X-Box 360s, Sony Cybershot Digital Cameras, Nintendo DSi consoles, Sony Playstation 3s, gift vouchers up to the value of £150 from a number of retailers including Next, M&S and Tesco and much much more. Smaller prizes also include money off coupons and Andrex Puppy goodies including pyjamas cases, hot water bottles, cuddly toys and slippers. To enter, all fans have to do is play the new ‘Pup-o-matic’ game. 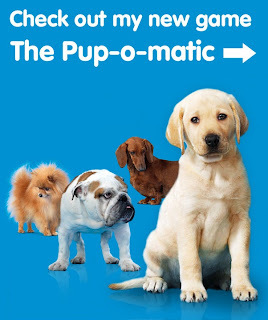 Similar to a slot machine, the fruit symbols have been replaced with the Andrex Puppy and his ‘Soft’, ‘Strong’ and ‘Long’ friends that feature in the new Andrex advertising campaign – a chihuahua, a bulldog and a sausage dog. Matching dogs means prizes. For a chance of winning, visit www.facebook.com/theandrexpuppy and enter. The competition runs until 5th July 2010. So go on and have a go, and if you win a super dooper prize, do share with the lovely Frog who told you about it! Thanks for that. Will do. Like your blog!